Each year, the BASIS.ed community has the pleasure of celebrating the accomplishments of our entire network of students, participating each year in the presentations of their findings. The richness of the accomplishments of the students knows no limit; we'll share with you each week the abstracts and videos for you to get to know some of our students. 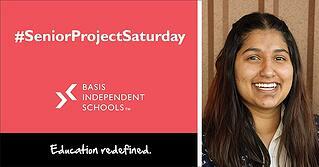 Meet Nandini Sharma from BASIS Phoenix and keep reading for her presentation abstract. Radiation therapy (RT) plays an important role in the treatment of prostate cancer. With the development of advanced equipment, more precise doses of radiation can be delivered to target tumors directly, allowing for hypo-fractionated radiotherapy regimens that use higher doses in fewer administrations. Clinical studies are evaluating the differences between the effects of fractionated and single, high-dose radiotherapy on patients’ outcomes (i.e., tumor resistance, overall survival). However, the biological response at the cellular level and the different cellular pathways involved remain unclear. We developed an exploratory biodosimetry study to understand molecular changes in three different prostate cancer cell lines (PC3, DU145 and 22Rv1) by analyzing expression of a gene panel previously identified to be involved in biological processes such as cell death, cell signaling, inflammation and DNA repair. Clonogenic survival assays and proliferation assays were also used to determine the cellular response to different methods of radiation. Results showed differences in gene expression between prostate cancer cell lines, highlighting the extreme variability of the types of prostate tumors. In the study of single and fractionated dose treatment, gene expression varied widely as did the cellular response assessed through clonogenic and proliferation assays. As the targeted genes are known to be involved in biological processes in response to radiation, they provide important information about the cellular response in different radiation protocols. For more, read Nandini's blog documenting her experience during her Senior Project.